Do you ever get those annoying emails that offer nothing but useless information? We'd all rather get newsletters that actually offer us something useful - like a discount or an offer. And that's why signing-up to the Airparks newsletter is such a great idea, because we'll do exactly that. If you're a regular traveller, you often go on business trips or you just want to cut the cost of your next holiday; sign-up below and start saving today. Of course, if you're not travelling yet, it's an ideal way to know that when you do, it'll cost you significantly less. "Problem-free as always - the staff are friendly and efficient. And it's good to get a 10% discount." "Very easy to use website, great discounts - you are the only site that I would book parking through, again and again!" How can I make the biggest savings? Easily. By signing-up and parking at one of our eight Airparks car parks. 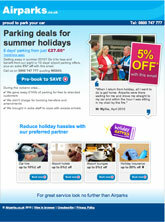 Airparks is the largest off-airport parking operator in the UK. We have car parks at eight major airports and we're proud to park your car. With over 18 years' experience in airport parking, you could say we're experts. Offering both low-prices and a quality service, why look any further?